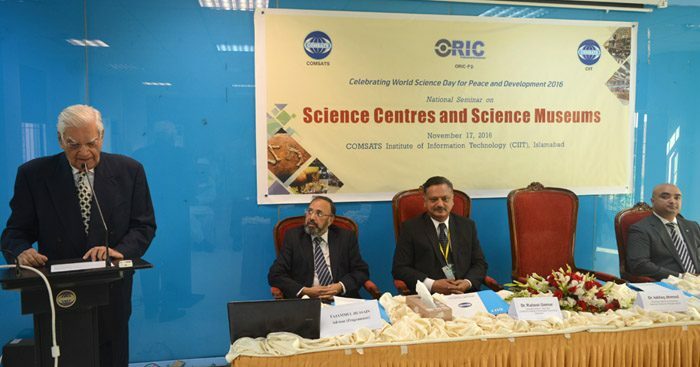 COMSATS, in collaboration with the Office of Research, Innovation and Commercialization (Professional Development Department) of COMSATS Institute of Information Technology (CIIT), Pakistan, held a seminar to celebrate the 2016 World Science Day for Peace and Development, on November 17, 2016, in Islamabad. The seminar’s theme was aligned with the theme of this year’s Day, ‘Celebrating Science Centres and Science Museums’. 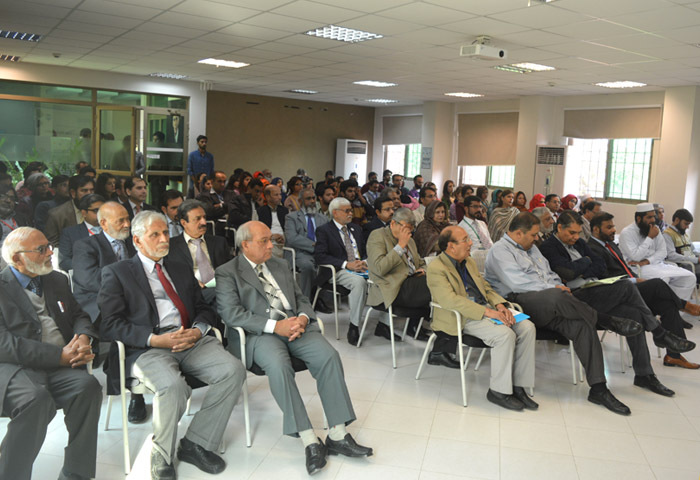 Dr. Ishfaq Ahmad, a veteran scientist and former Special Advisor to the Prime Minister of Pakistan on Strategic Programmes, was the Chief Guest on the occasion. In his inaugural address, Dr. Ahmad stressed the need for making concerted efforts for the promotion of Science and Technology in the country. He noted with pleasure Pakistan’s role in institutionalizing UNESCO’s World Science Day for Peace and Development, for which he personally played an important role in the late nineties. He hoped that Pakistan Science Foundation (PSF) will play a crucial role in promoting culture of science in the country. 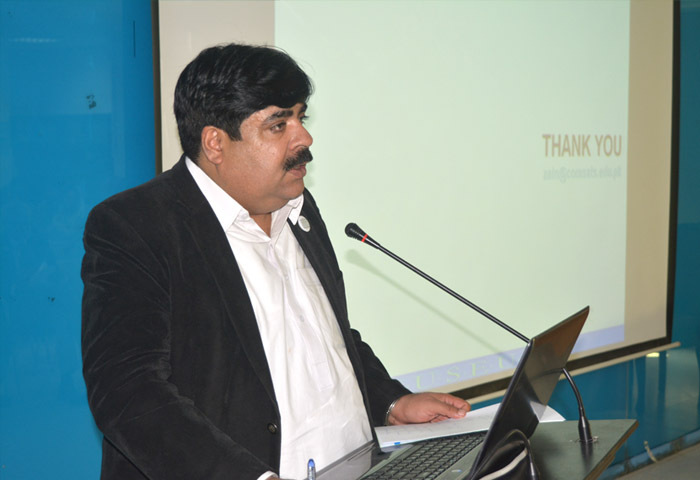 Representing the host institution, Dr. Raheel Qamar, Dean, Research, Innovation and Commercialization, CIIT, delivered welcome remarks. He noted that science centres can help nurture scientific thought and encourage the masses towards research and scientific learning. He urged the public sector to support science centres and science museums. 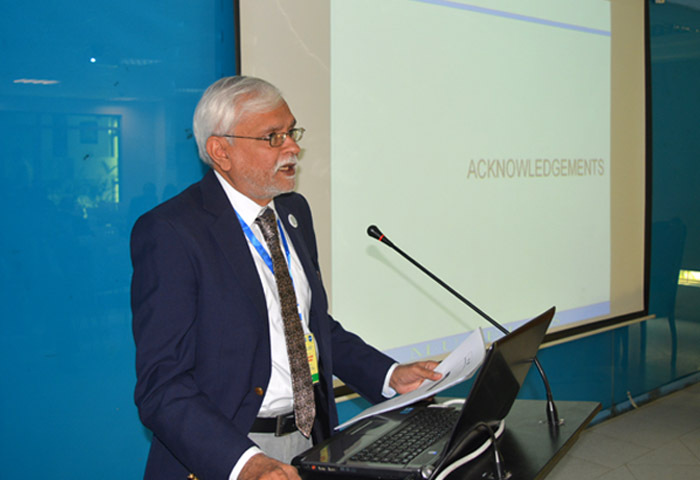 The message from Mr. Fazal Abbas Maken, Federal Secretary, Ministry of Science and Technology, Government of Pakistan, who is also the Executive Director COMSATS, was read out by Mr. Tajammul Hussain, Advisor Programmes (COMSATS). In his message, Mr. Maken opined that science centres/museums help develop understanding of the physical laws of nature, raise public awareness regarding current research activities and stimulate interest in science among students. He also highlighted COMSATS’ role over the years for promotion of science and technology in the developing countries, which is in keeping with the spirit of the World Science Day celebrated by the world community. Director General UNESCO, Dr. Irina Bokova’s message was read out by Mr. Raza Shah, National Professional officer, Natural Sciences, UNESCO Country Office, Islamabad, in which she considered science centres important for capacity-building, advocacy, and to send strong messages about the importance of science for sustainable development. She also called for partners and governments to support science museums and centres. The technical session of the event comprised talks by Dr. Zain-ul-Abedin, Advisor, Department of Architecture, CIIT Islamabad Campus; Mr. Mian Attique Ahmad, Secretary General, Museums Association of Pakistan (MAP); Ms. Fatima Sami, Graphic Exhibit Designer, National Museum of Science and Technology (NMST), Lahore; and Dr. Tariq Bin Tahir, former Director General, Pakistan Atomic Energy Commission (PAEC), Islamabad. In his presentation entitled ‘Science in Service of Museums and Heritage, the Role of CIIT’ Dr. Abedin believed that a lot of learning occurs outside classrooms and that museums/science centres encourage critical thinking. Representing a higher education institution (HEIs) himself, he noted that the role of museums has evolved over the decades and HEI’s need to integrate museums in teaching methods as a high impact, significant, and experience based knowledge interface. 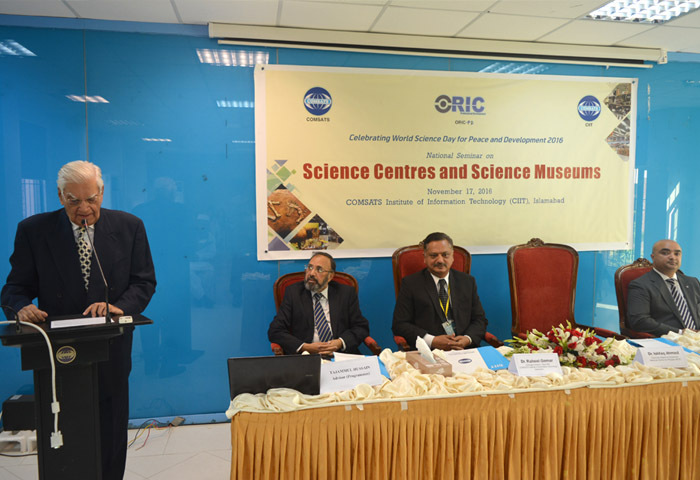 Mr. Ahmad’s talk was entitled “Role of Science Centers and Science Museums as Educational Institutions at Regional Level”, in which he asserted the need for promoting museology in Pakistan, for which he deemed the government’s support is crucial, in addition to that of the general public. He shared his experience of working at district levels for the establishment of museums, as well as the aspirations of MAP in undertaking innovative means in collaboration with CIIT to promote museology in the country. With reference to the World Science Day theme, he remarked that science centres and science museums help promote peace in the society. 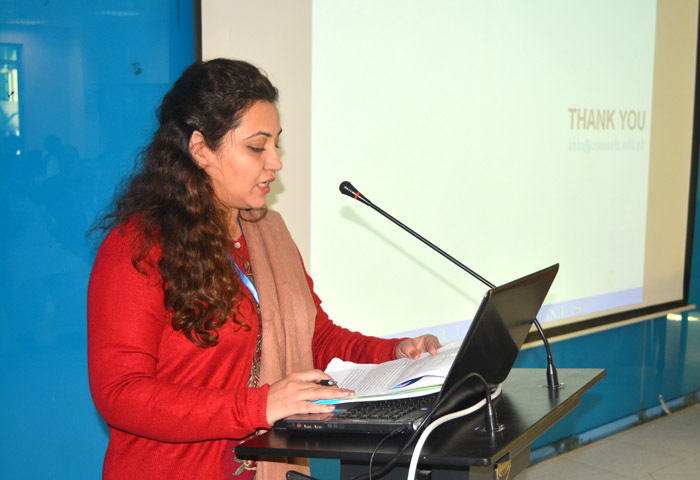 Ms. Fatima in her presentation introduced NMST-Lahore as a non-profit organization in the service of the society and its development, which acquires, conserves, reaches out to and communicates and exhibits the tangible and intangible heritage of humanity and its environment for the purpose of science education, study and enjoyment. She noted that NMST aims to create scientifically educated citizenry in the country, evoke interest in S&T and development of scientific attitude in the masses, as well as supplement the teaching of science at school and college levels. She informed that the principal operations of the Museum include collection of specimens and other materials relevant to S&T, carry out exhibitions and science fairs, and organize focused science education activities. She informed that NMST has around a hundred thousand visitors each year. 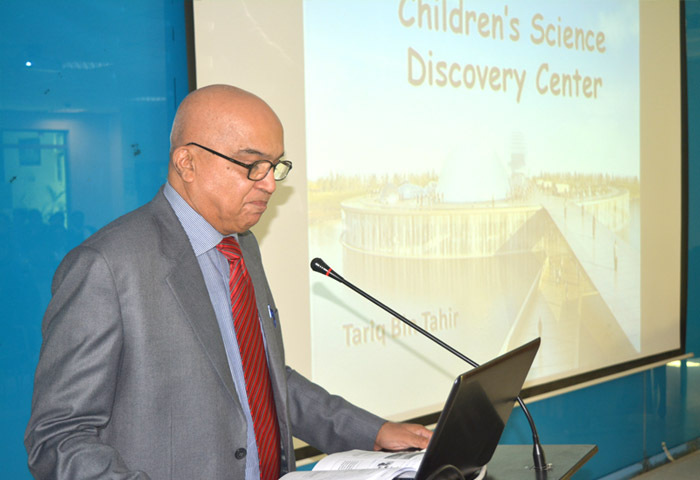 Dr. Tariq presented a proposal on establishing ‘Children Science Discovery Centre’ in the country, benchmarking renowned museums from around the world. He noted the changing paradigm in science museums that now encourage more interactivity, apart from exhibiting ideas, artefacts and technologies. He noted that there is a paradigm shift nowadays as science museums are transforming themselves into science discovery centres that encourage interactivity with displayed scientific specimen. He noted that such centres are especially designed for children to encourage greater learning of science and engineering. Mr. Tariq’s proposal stirred the interest of the audience. Mr. Arif Masoud, Consultant Architect CIIT, offered to collaborate with him for taking his proposal forward. The seminar concluded on the note of making concerted efforts by the relevant stakeholders for the promotion of science and technology and supporting science centres and science museums.